Dogs like to eat things, and sometimes those things lead to upset stomachs. 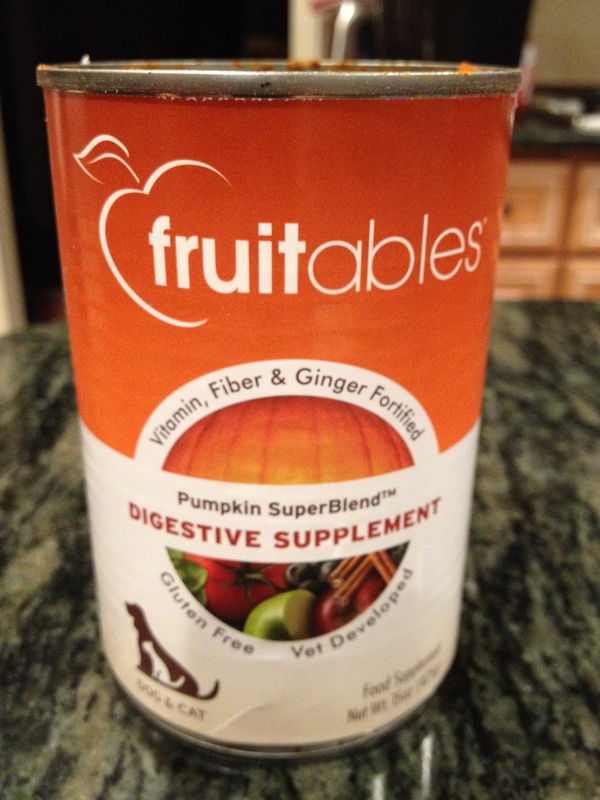 From my experience, Fruitables Digestive Supplement is a great way to help alleviate those stomach issues and my recipe for Upset Tummy Cookies will do the same, as well as be a tasty treat any day of the week. So, once again, this product review and recipe derived from necessity. Approximately two minutes into our morning walk yesterday, Rynoa ate something (still don’t know what) that caused her to start what I thought was gagging and to vomit almost instantly. I immediately rushed her to the vet as the gagging-sound continued. The vet said she was suffering from something called reverse sneezing, which is when a dog makes an unpleasant respiratory sound that sounds like they are dying. It’s usually caused by an irritation to the soft palate and throat that results in a spasm. (That is according to the description my vet gave me.) In Rynoa’s case, it led to vomiting. To treat it, they gave her a shot to ease her nausea. However, even after she got home, she vomited one more time and was still making the gagging sound a few hours later. Despite her reverse sneezing, Rynoa, who had thrown up all her breakfast, appeared to be hungry. The vet said she could eat if she was hungry, but only a small amount at first to see how she would tolerate food. That’s when I remembered I had purchased the Fruitables Digestive Supplement on a whim from a local pet store. It is made of a pumpkin puree with apple pomace, spinach, flax seed, cinnamon. ginger and vitamins, and the can claims it soothes upset stomachs. I gave her a scoop and she woofed it down. Now, this could be a coincidence, but the gagging stopped after she ate the supplement. I gave her more later on mixed with her regular dog food, and despite trying to eat leaves and nibble on grass, the symptoms of the reverse sneezing subsided. Fortunately, Rynoa’s doing a lot better today. Back to epic fetch sessions and grazing-free walks. I still had the majority of the digestive supplement left, which got me to thinking what I could do with it. Making cookies was the first idea that popped into my head. 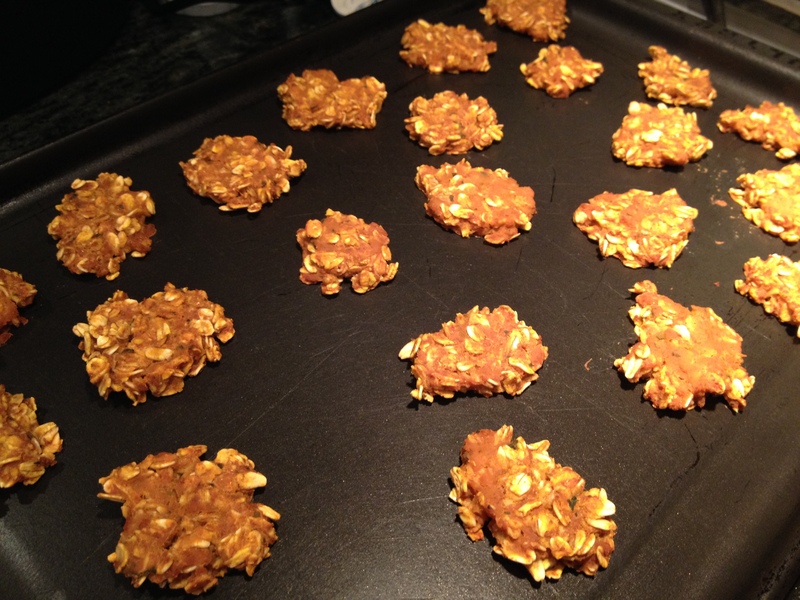 I saw these two-ingredient banana and oatmeal cookies on the Rachael Ray show a while back and decided to see if they would work with the supplement. It did, and Upset Tummy Cookies were born. If you don’t have the supplement, feel free to substitute canned pumpkin. I would mix in a little applesauce for sweetness and ginger for added digestive benefit. Just make sure your ratio of wet and dry ingredients is equal. Also, please note Rynoa is used to high-fiber foods. Her favorite snacks are carrots, green beans and sweet potatoes. 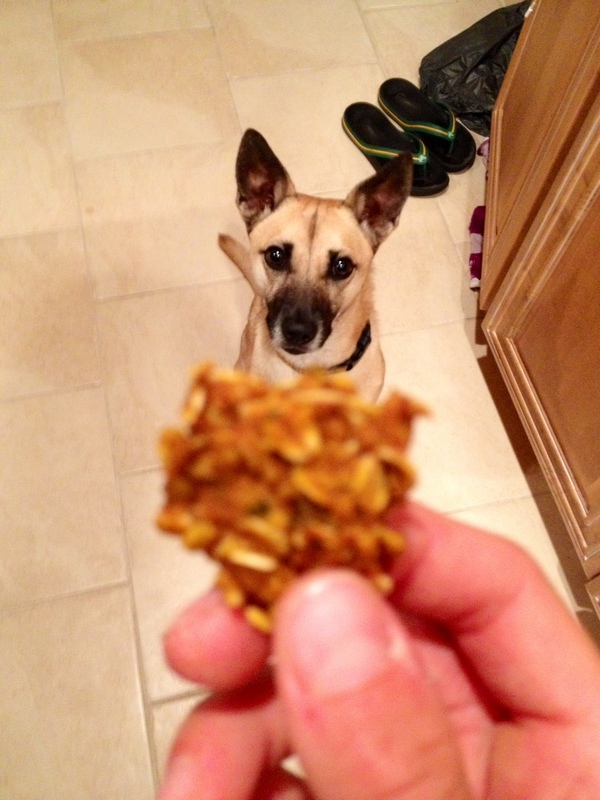 Other dogs may be sensitive to the high-fiber levels of both the supplement and the treats. I would try smaller amounts to make sure they can tolerate it before you let them have free-reign of the cookie jar. Preheat an oven to 350 degrees. Mix the supplement with the oats until well-combined. Spoon onto a cookie sheet in small balls. Then pat down the balls until they are around a centimeter high and make circles about an inch in diameter. Bake for 15-18 minutes depending on the cookies thickness. Make sure the pumpkin puree is no longer wet and sticky before taking them out of the oven. Let the Upset Tummy Cookies cool completely before giving them to your dog. You don’t want to burn their tongues!